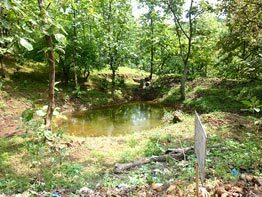 Gurudev Jagadguru Shankaracharya Swami Swaroopanand Sarasvatiji Maharaj‘s ashram in Paramahamsi, Jyoteshwar, Zilla Narsingpur 487118.M P, has been the first place to experiment with the principles of Rain Water Harvesting. 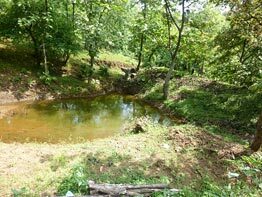 Dig small tanks (10 by 10 and 8 feet deep) in the ground and let the water fill in them while raining. The first year will let the water soak in the earth, second will be better and by the third year it will remain above the ground level. This water can be used for the house, farm, animals, birds. Train the rain water to first flow in the direction you want it to flow as you can direct the water to walk. Once you have trained the water to Walk you teach the water to Crawl. Once the Water starts Crawling you teach the water to sit in one place. Result the water collects in the tank you have dug and soon you can use this for various purposes. Water we use for our bath, cleaning dishes, washing clothes, can also be directed towards the yard where we grow vegetables, fruits, flowers as the soap nowadays are biodegradable and do not harm the plants. Pujya Gurudev has used these principles to utilize water economically in his own residence “MANI DWEEP“ and has started RAIN WATER HARVESTING in VICHAR SHILA. Let us all make a conscious EFFORT to Be MORE AWARE of WATER and How We Use It. Rain, Sun and Wind has been given to us free of cost, but if we do not make use of it we certainly will empty the earth of these vital elements. The theory on which rain water harvesting works is to teach the flow of rain water to walk, when it learns to walk teach it to crawl ( rengna ), and when it starts crawling hold it in one place. It takes 3 years for the water to start holding as the first 2 years the ground pulls all the water. For the water to stay in one place the flow of the rain water has to be recorded and the ground level. Start from the top level as flow of the water is top to bottom. once you can see the place where you can build a collection point you will need to excavate part of it and the soil that you get out from excavation can be used to build the wall to prevent the water from escaping. The level of water under the soil is raised as the surface water charges the ground and moisture holds in the ground too, result is the area becomes green. 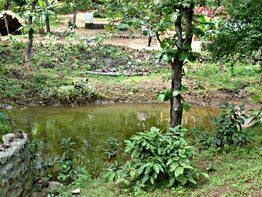 Rain water harvesting first stage has been completed in Paramhamsi Ganga Ashram in the year 2009. We started the work on top of the mountain behind Vichar shila. Stones were collected by 50 boys and barricades were made to slow down the flow of the water and prevent erosion of soil. After we found the contour of the land and the slope we built a johad or collection point where the water from the top accumulated. A J C B machine was used to excavate the soil and the wall of the johad was made with the same soil, no concrete was use, this collection point did hold 90% of the water and with the result the ground below got recharged with this water and now we are using this water for the gardens and cattle. 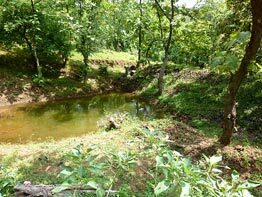 It is heartening to see the revival of traditional water harvesting systems in various ecological zones of India. Communities in the face of adversity have revived or created new water harvesting systems. They have made checkdams, johads, and other structures to harvest every drop effects of recurring drought of drain. Some of them have even harvested rooftop runoffs. After 2 yrs of saving rain water and charging the ground with the rain water the entire area is green and the place attracts birds, butterflies who keep chirping the whole day. The only way to SAVE OUR PLANET is to do Rain Water Harvesting.